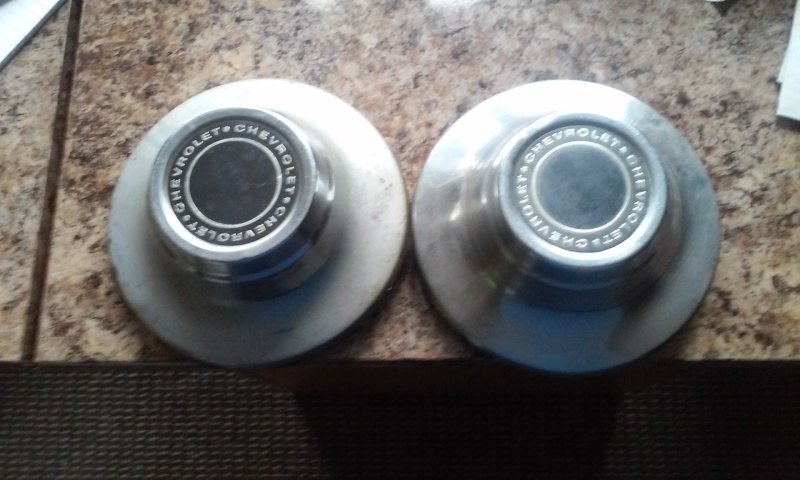 My 73 SS only came with 1 correct factory cap, looking to get 3 to complete the wheels. My car is dark res metallic so I need the light argent versions. I think Limey has 3 of them in the dark argent. Anything you get you will have to respray anyway. If your not going to spray them with a gun then I heard that Duplicolors Argent Silver is a perfect match. All of the used argent ones I've seen in person look like they are the normal stainless under the paint. So even if you got a pair of stainless ones (camaro or nova came with them) I'd paint them. Especially since you can scuff them with some 100 grit, shoot them with 2K (not 1K) primer in the spray can, and then some argent in a spray can. Nice medium wet coats and it would look excellent. Buyer Backed out told me he wanted them and nothing ever heard from him and that happened 3 times after that, The lesson learned don't mark sold till cash in Hand. Anthony, if you can find your 3rd I'm interested in buying all 3, thanks. OK guys, now I just need one. Anyone got a single center cap? No longer searching, I have all 4 now. Joe73 wrote: I think Limey has 3 of them in the dark argent. Anything you get you will have to respray anyway. If your not going to spray them with a gun then I heard that Duplicolors Argent Silver is a perfect match. Does anyone know what Duplicolor paint to get? I am not finding Argent silver in Duplicolor spray can, but there are a handful of other silvers at Pep Boys. Going from memory here but hwp101. Google that number. there we go, thanks Joe!